I have been dreaming of this day for a long time. Is she done? Is she shiny, smooth and beautiful? Is she the museum-quality show piece she will someday become? No on all counts. Did we have a blast driving her anyway? Totally. Last weekend we took our little foray to the gas station for her first fill up. I discovered shortly after, Matilda is rather picky about her choice of beverages. This little car barely runs when fed 10% ethanol pump gas. I did a little asking around, and there is a place in Tangent, about five miles from here, that has ethanol free premium. Fortunately, a five gallon Jerry can is practically a full tank for Matilda. She still managed to sputter a bit, even with the new fuel. As a last-ditch effort for a simple fix, I changed the spark plugs. That was all she needed. Now, she ran more smoothly, all but stopped stalling and even idled! This gave me the confidence to venture across the highway to visit a few friends who live about a mile away. The trip went very well. It did die once, while I was decelerating from the fastest speed (55) she's seen in a long time. Luckily, a quick pull of the choke, a few accelerator pumps and we were under our own locomotion again. We did a little more running around and visiting, and then headed for the barn. This was all Saturday. Today the forecast kept promising that the fog was going to burn off at some point, and we would see the sun again. No such luck. Finally, we decided to bundle up and hit the road anyway. 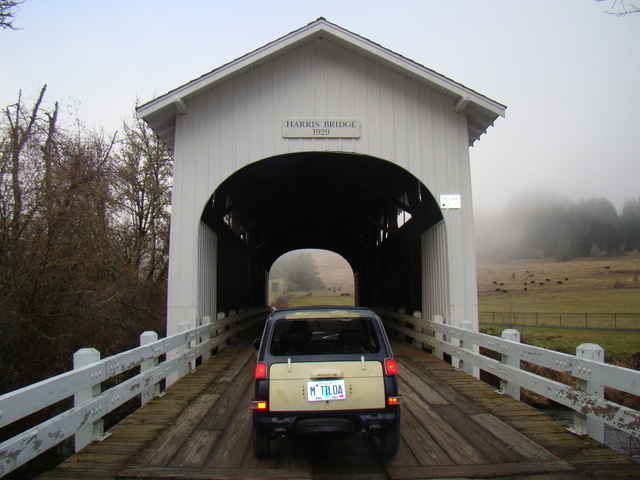 There is a covered bridge a little over ten miles from our house toward the coast. 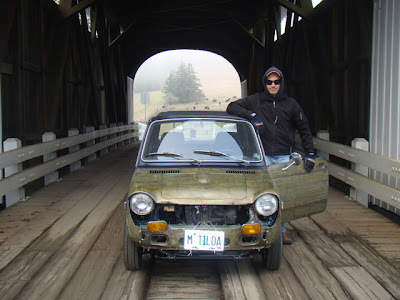 This seemed a little risky, since in addition to being farther from home than Matilda's been since she became Matilda, it was foggy, there was highway traffic and there is no cell service at the bridge. With all that in mind, we decided to have Carley and Josie follow me in the pickup, just in case. Turns out, we needn't have worried. Matilda made the whole 22 mile trip like a champ. She even climbed the hills at 55. I had an '87 Civic hatchback when Carley and I met that wouldn't even do that. I'm sure once the interior is in, and I have a passenger and a half (Josie) it will be 45 and third gear, like that old Civic. But for a two cylinder 36 hp engine, I was tickled. We started the weekend with 14 miles on the odometer, and now have 56. I have taken pictures, and filled out the paperwork for the classic car insurance company. I realized when I saw that I needed to provide proof of ownership, that the parts car is the one that is titled. I've effectively changed the body, and therefore the VIN, so I will have to drive down to the DMV sometime this week to do a title transfer. Any excuse to drive her.. .
Not too pretty, not too proud. 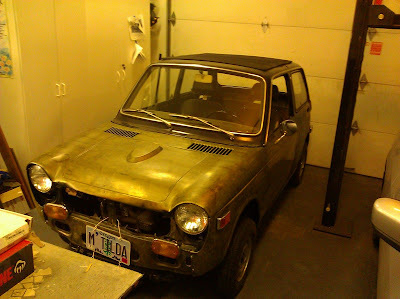 I've been collecting informal estimates to get the final body and paint work done, and keep getting asked to, "Bring it in, so can see what we're working with." So it occurred to me I could put the doors and fenders on, get the lights working, install some seat belts and drive it in to the shops. I realize that almost everything I put on, will have to come back off for the paint job, so I have to keep my improvements to a minimum. So far, I've been getting figures between three and five thousand dollars to make this little ride smooth and shiny. Considering I have less than that saved, and I refuse to go into debt for something like this, it made more sense to wait until next winter to make her pretty, and just drive it as is. That way, with a bit of a cash buffer, I can get this job done right, and in the mean time, we get to actually drive the car! So today, we took a short, and slightly illegal (as we have yet to procure insurance), trip to the gas station for Matilda's first fill-up. We'd been running on the first gallon of gas we put in when we did the first test fire those many months ago, and ran out of gas on the way. Fortunately, Matilda weighs little enough, that it was a pretty comfortable push home. Naturally, a city bus just had to come around the corner as we were trying to stay in the bike lane, but it all worked out. We got gas, I did the first oil change, and re-tightened the CV shaft bolts and bent the holding tabs. Our seat belts will be here Wednesday. That just leaves insurance. I tried talking to our usual insurance company, but they were sky-high. I've since talked to two collectors' car insurance companies, and should hopefully be covered by the end of the week. With any luck, we should be able to take a substantial drive next weekend. I really want to get a couple of hundred miles on this engine to make sure it will make it.